Dragon is a space capsule designed by SpaceX to provide supplies to the International space station. SpaceX was one of two winners of the NASA Commercial Orbital Transportation Services competition. The SpaceX portion of the award is $278 million for three flight demonstrations of Falcon-9 v1.0 carrying the Dragon spaceship, which occured in mid 2009 and 2010. The prototype Dragon C1 capsule lacked several systems of the operational Dragon-C capsule. The second and third test flights were eventually combined into one mission and culminated in the transfer of cargo to the International Space Station (ISS) and return of cargo safely to Earth. The agreement also contains an option for three demonstration flights of the seven person manned version of Dragon taking people to the ISS and back. The cargo Dragon and crewed Dragon are almost identical, with the exception of the crew escape system, the life support system and onboard controls that allow the crew to take over control from the flight computer when needed. In addition to servicing NASA needs, the F9/Dragon will possibly also be of service to Bigelow Aerospace, which plans to orbit a commercial space station. Bigelow Aerospace and SpaceX have an ongoing dialogue to ensure that F9/Dragon meets the human transportation needs of their planned space station as efficiently as possible. In December 2008 SpaceX received a contract under CRS-1 to deliver 20.000 kg to the ISS by the means of 12 Dragon flights. In March 2015, three more missions were added to the contract for launches in 2017. 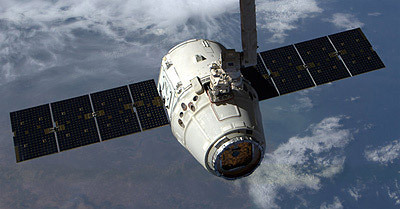 In December 2015, five final missions were awarded under CRS-1. Dragon CRS-7 was lost in a launch failure. Under the CRS-2 selction in January 2015 Dragon was selected for a minimum of six missions, which will use a cargo version of the Crew Dragon spacecraft.